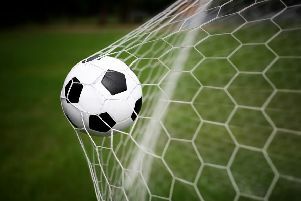 LITTLEHAMPTON Football Club were knocked off top spot in County League Division 1 by Dorking Wanderers on Tuesday evening. Golds’ match at fellow title challengers Eastbourne Town was postponed owing to a waterlogged pitch and Dorking took full advantage, with a late 1-0 win at Broadbridge Heath. Dorking moved three points clear of Littlehampton, although Golds have two games in hand and a superior goal difference. Third-placed Pagham, who Littlehampton travel to on Saturday, suffered a 1-0 defeat at Eastbourne United on Tuesday. They trail Golds by five points and have played a game more. Littlehampton boss Mark Bennett is looking forward to Saturday’s clash and said: “It’s a game that everyone at the club is looking forward to. There is a little bit of tension between the two sides, so that will add that bit extra to the game. “It’s a local derby as well and any team always wants to beat their local rivals. “The game we played earlier in the season was a really tight and feisty affair. Golds won the previous meeting between the sides 1-0 in October and Bennett admitted his side will be going into the match looking to win. He said: “We go into every game looking to take the win. “If we can avoid defeat that would be good but, ideally, we would like to win the game. Bennett was disappointed that his side’s match at Eastbourne Town, who had lost two successive games, was postponed on Tuesday. He said: “It would have been a great time for us to face them. “They have not been on the best of runs of late and, if we had got the win, that would have put a 12 point gap between us. “We have been in decent form and all of the lads really wanted the game to be played.